Explain Phases of the waterfall model? In “The Waterfall” approach, the whole process of software development is divided into separate phases. The outcome of one phase acts as the input for the next phase sequentially. This means that any phase in the development process begins only if the previous phase is complete. 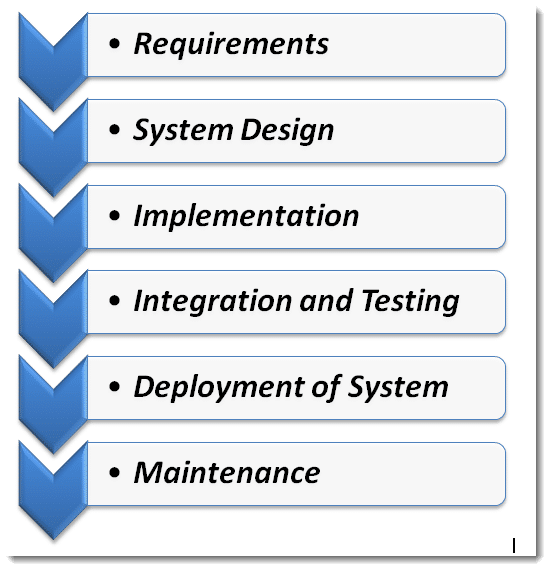 The waterfall model is a sequential design process in which progress is seen as flowing steadily downwards (like a waterfall) through the phases of Conception, Initiation, Analysis, Design, Construction, Testing, Production/Implementation, and Maintenance. etc. Here, the specifications of the input and output or the final product are studied and marked. which is referred to as Unit Testing. not face any problem during the installation of the software. customer environment or released into the market. change requests initiated by the customer, or defects uncovered during live use of the system. Client is provided with regular maintenance and support for the developed software. *The advantage of waterfall development is that it allows for departmentalization and control. A schedule can be set with deadlines for each stage of development and a product can proceed through the development process model phases one by one. *The waterfall model progresses through easily understandable and explainable phases and thus it is easy to use. *It is easy to manage due to the rigidity of the model – each phase has specific deliverables and a review process. *In this model, phases are processed and completed one at a time and they do not overlap. Waterfall model works well for smaller projects where requirements are very well understood. *It is difficult to estimate time and cost for each phase of the development process. *Once an application is in the testing stage, it is very difficult to go back and change something that was not well-thought out in the concept stage. *Not a good model for complex and object-oriented projects. *Not suitable for the projects where requirements are at a moderate to high risk of changing. =>This model is simple and easy to understand and use. =>It is easy to manage due to the rigidity of the model – each phase has specific deliverables and a review process. =>In this model phases are processed and completed one at a time. Phases do not overlap. =>Waterfall model works well for smaller projects where requirements are clearly defined and very well understood. =>Once an application is in the testing stage, it is very difficult to go back and change something that was not well-thought out in the concept stage. =>No working software is produced until late during the life cycle. =>High amounts of risk and uncertainty. =>Not a good model for complex and object-oriented projects. =>Poor model for long and ongoing projects. =>Not suitable for the projects where requirements are at a moderate to high risk of changing.